The basic agenda and minutes space is a template, with the title, the participants, date, time and location. When you print or email your agenda all information will be formatted in a professional looking document. In addition there is another template feature; you can load a standard meeting outline (list of topics) by choosing one of the standard MeetingKing templates or one of your custom templates. On the top of your note taking area click the “Templates” button and select “Load template”. 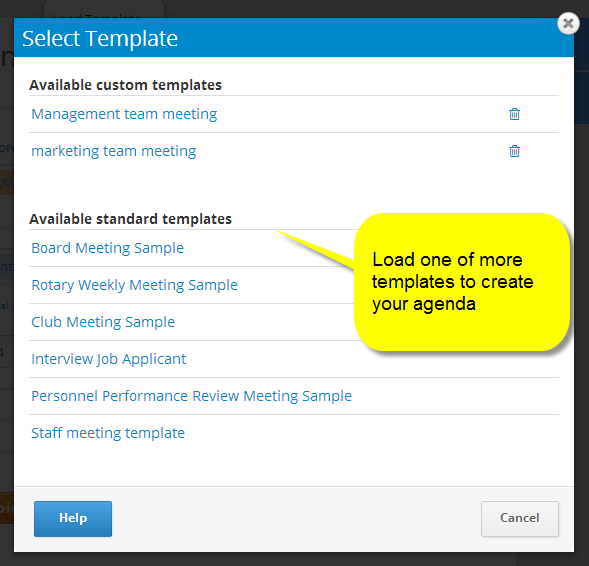 You can select one of the standard MeetingKing templates or you can select one of the templates you created yourself. Once a template is loaded, you can modify the agenda as you see fit; you can delete topics, you can move them to a different location (click and hold the move link and drag the topic to a different location or even to the Parking Lot) and you can add additional topics. You can even load multiple templates in one meeting. Creating your own templates is really easy. If you have a meeting agenda/minutes structure you want to use for future meetings, just click “Templates”, select “Save as template”, give it a name and save it. By default it will only save the Topics and any topic tags, but you also have the option to include the Notes, Decisions and Tasks in your template (including private notes for instructions). Internally we created templates for our board meetings, development meetings and marketing meetings. Templates are also great for a checklist or if you have multiple similar meetings where you want to ask the same questions, for example: personnel reviews, job interviews, etc. By making team and private notes you can decide what information you share and what information you keep for yourself. The possibilities for using meeting templates are limitless.